The mall that my sister and I shopped at yesterday had a Lululemon store, which sells athletic wear. They have very nice running clothes and I was excited to get a new track jacket. 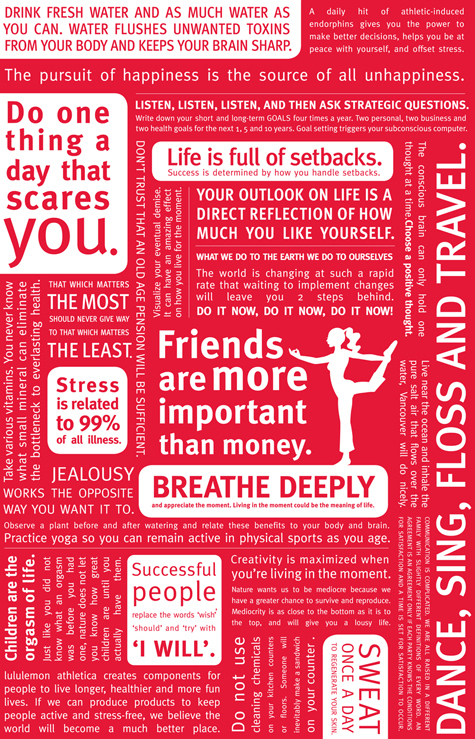 However, I am equally excited to now own a Lululemon bag with the company "manifesto" printed on it. I saw these reusable bags behind the counter before I found the jacket, read a few of the statements, and said aloud, "I want that bag!" My sister scanned it over herself and said, "That is a very 'you' bag." -Your outlook in life is a direct reflection of how much you like yourself. -That which matters the most should never give way to that which matters the least. -Sweat once a day to regenerate your skin. I straight-up-love reusable bags. But this one is especially appreciated, as every time I use it I will internalize these inspirational truths.